Satisfied customers will all appreciate a 1930 Tractor Trailer Truck logo printed. Applications include trucking and transport companies, warehousing related. Features of the truck include hardwood construction with a lacquer finish. Wheels do roll, so your truck keeps on truckin' for a highly realistic gift. Cashews in sealed bags are included to finish off the presentation. Truck and Treats are packed together in white shipping gift box. Overall approx. size of Replica Truck is 12 1/4 x 3 1/4 x 4 1/4. The candy-nuts are Made in the USA. Price includes a gold foil stamp on both sides area 2 1/2" w x 1" h.
One color art only for logo print design on this product. Logos do require an Illustrator ai, eps or pdf art file. Bought 48 of these replica trucks with the candy and nuts. 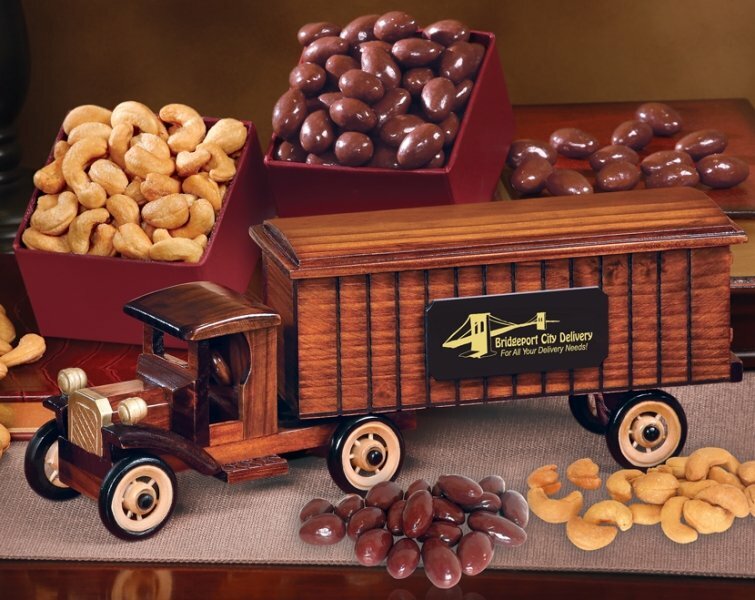 The trucks detailing is excellent, our logo looks fine and the chocolate almonds with cashews was the icing on the cake. All in all a quality product, the rep performed his job well and I am very satisfied with my order.